There’s good news for Lady Felicia fans this week! 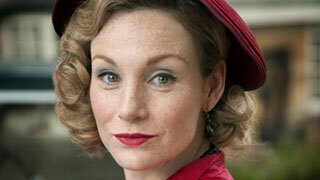 The lovely Lady, played by Nancy Carroll, will be returning to Father Brown in the opening episode of the seventh season which airs Thursday, April 4th at 9pm. Unfortunately, Carroll’s character hasn’t returned to the fictional village of Kembleford for the entirety of the series, but she will be seen in a later episode, and I hope you agree that a bit of Lady Felicia is better than nothing. 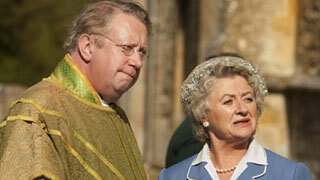 Father Brown is preceded by Death in Paradise at 8pm and is followed at 10pm by The Wrong Mans and Mum at 10:30pm. What a terrific Thursday night line up! Sunday evenings also have a decidedly British flair as the evening programming gets underway at 8pm with Call the Midwife, which is followed at 9pm by the third and final episode of Mrs. Wilson, and at 10pm by a a brand new series of Masterpiece’s Unforgotten. The third series of this "cold case" mystery again stars Last Tango in Halifax’s Nicola Walker and Indian Summers’ Sanjeev Bhaskar. It starts Sunday, April 7th. So that’s lots to look forward to this week!